Technological advancements over the past several decades have been invaluable to modern-day society, but the rapid increase in cell phone use also has the potential for disaster. 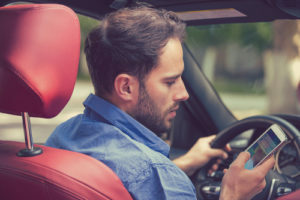 Increasingly, more adults are attempting to utilize their cell phones while driving, and this behavior has repeatedly been shown to have disastrous consequences. In response, legislation has been passed in many states that prohibits cell phone use while behind the steering wheel. Does Cell Phone Use Amount to Negligence? If an employee is both driving and taking a work-related phone call, then the employer might be held liable for any damages involved with an accident. Similarly, the employer may be held liable when an employee attempts to send a work-related text message while driving. Most employers have a strict no-phone policy while employees are driving for this reason. Younger drivers are some of the most likely drivers to be on their phones while driving. It’s important for young adults to understand that searching their phones for music, utilizing their smartphones for GPS directions or any other activity on their phones is extremely dangerous. Because of the susceptibility of younger drivers to use technology, some states have even more stringent cell-phone restrictions for novice drivers. In some situations, the teenager or young adult’s parents have been held liable for accidents involving phone use. Did you or a loved one sustain serious injuries due to a texting and driving accident in New Jersey? Don’t let the medical bills pile up while you wait for the negligent party or their insurance company to do the right thing. Right now, you need an aggressive personal injury attorney on your side, fighting to get you the compensation you need, want, and deserve. The skilled attorneys at Rudnick, Addonizio, Pappa & Casazza represent clients injured because of a distracted driving in Middletown, Howell, Marlboro, Manalapan and throughout New Jersey. Call 732-264-4400 or email us to schedule a consultation about your case. We have an office conveniently located at Park Village, 25 Village Court Highway #35 Hazlet, NJ 07730 as well as offices in East Brunswick.